Monday nights are usually a day for us to rest, after a long day at work and most likely still recovering from the weekend, it’s definitely a day for relaxation. But last night was a bit different for most of Auckland city, as swarms and squads powered through to Spark Arena to see the songstress known as Katy Perry kick off her New Zealand, and last leg of her Witness Tour in Auckland, and let me tell you, nothing was left behind. Big dice, oversized flamingos, props of eyes that were watching all night long, you name it and K.P most likely had it on her stage. I’ll get into the 11 + costume changes later! This new tour brought with it a slightly more random and at times, forced visual pop aesthetic. With seating being made on one side of the stage and a mosh pit feel on the other, the arena welcomed us with an eye looking around the room on the massive eye-shaped screen behind the stage. A distorted video of Perry flickered on the massive screen while her backing band and dancers flooded the stage to create a wall of noise that sat somewhere between a warped news theme and a pixelated video game feel. Given the insanely detailed, colourful and at times actually scary props, costumes and overall production, Katy Perry rolled out one of the best performances I’ve seen this year. Especially after hearing so much great feedback about her 2014 Prismatic World Tour, I was intrigued and anxious to see just how the superstar planned on kicking things up a notch for Witness: The Tour. To seriously kick things off, international DJ ZEDD was the opening act us, and I won’t lie to you all, I was SO damn excited to see this dude live! 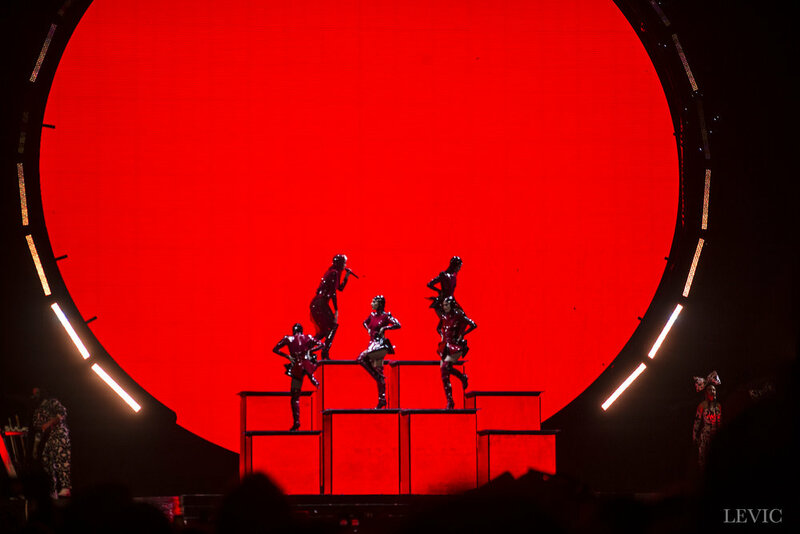 He was THE perfect opening act for this tour, as HIS visuals and pop enthused EDM connected well to what Katy and her team were trying to ensure. Unfortunately there were a lot of younger kids in the crowd, some I think as young 6 or so, whose ears were not enjoying the DJ’s set. As parents flooded and scrambled to get ear plugs for their wee ones, the rest of the arena jumped, moshed and sang along to Zedd’s incredible set. I can see how his music is not for everyone but I think is mixed well for the performance we were about to “witness”, pun intended. Leading into her fist full song, Dark Horse, Perry stated, "If some of you only came to hear this song, I want to hear you sing!” And yup, we SANG (that was one of the songs I was waiting on) while Perry faded into Chained To The Rhythm, a massive hit with the crowd I must say. These strange peculiar MASSIVE, lanky figured men with TV’s on their heads, wandered onto the stage with puppeteer’s controlling them in dark clothes from the bottoms, with the backing dancers donning television masks with menacing eyes on them. I was slightly confused but I got it eventually as my friend explained that her album was the whole “witnessing” era and the fact that her album cover literally is of an eye. The light bulb went off a tad late for Lisa. After the evening's first wardrobe change (yup the FIRST, the night was set for what you'd expect from a '90s music video) with visuals that represented the energy just perfect. Costumes were BEYOND what you were expecting, even from the dances, and the band, nothing was missed out. With dances changing costumes as much as KP, and the band chilling a black and white, Dalmatian enthused look, they all looked like a tight unit, which kicked the performance up a notch. Strapped with a pink guitar and dancing between giant flamingos (yup, you read that right), Perry proved the over-the-top stage design did not distract the plausible and positive reception of classic hits like Last Friday Night (T.G.I.F. ), Hot and Cold, and her first hit single I Kissed a Girl which celebrated the 10-year anniversary. A giant pair realistic lips hovered above the stage, the start of which was given a cute, ear piercing electro-pop makeover before the band slammed back the original in all of its pop essence. Crowd favourite California Girls had the arena singing for their lives and then out came "Left Shark", her famous meme shark, who subtly stole the show and danced on top of a giant piano to the tune of Chopsticks. I wish I could make this up but you read that all correct. Let’s just a take break from Perry for a second, I promise we will get back into that, I just want to give special mention to her guitarist Devon Eisenbarger, who absolutely shredded the main stage complementing the epic beats from drummer Tony Royster Jr. - who not only took the track to an roaring finish, but in my opinion the whole night. One of the nights highlight came in the form of a more intimate moment, as Perry - dressed head-to-toe in silver sequins, including a head piece - floated around Spark Arena sitting on a model of Saturn, strumming an acoustic white guitar and singing Wide Awake. It was part of the show I didn’t sing the words, even though I knew it all, I just wanted to hear her voice in its natural element. After spoiling longtime fans for their support, her love after over 10 years of music, her mini monologue of all things she has done in Auckland, and what she still hopes to do, (PS, if you’re around the Sky Tower on Wednesday, look up, KP states she will be doing the jump!) things got more intimate for powerful ballad Into Me You See, proving yet again Perry doesn’t need all the big production elements to leave a mark on her audience. Next, but certainly not least, was an overload Pac Man-themed rendition of Part Of Me - another classic that was given an electro-pop makeover. Perry surprised the whole arena with one final burst of sporty energy to deliver Swish Swish, as she sat atop a giant basketball hood for its bass-heavy verse and then flew through the hoop as the chorus kicked in. Two lucky girls, Jess and Jacinta were asked to come on stage and compete in a one on one, well in this case, a 1 on 2, as they all shot for points with a giant basketball to score points for bragging rights. The girls representing Auckland, and Perry LA. We lost. Now time for my personal fav of the night, which may come as a surprise. Mega hit Roar. The energy from the dancers was infectious as they bounced around the stage to its uplifting chorus. Not only has the song got such a great message in all its quirky pop ways, there’s just no way you can’t sing along and appreciate the song every time it plays. Where ever you may be. This time, watching it live, so WOW. Perry then sailed above Auckland’s Spark Arena, on a broken clock during Pendulum, which was complimented nicely by the chart topper in the finale Firework, a combination that truly highlighted the transformation of the artist since the release of the album. Fireworks made their appearance from the stage and her white and pink, fairy-ness costume glistened in the stage lights as she made her decent into the giant hand that protruding from the end stage. The only problem with pulling out all the stops with a global arena tour is you might struggle to one-up yourself next time. The show just proved that if you’re paying that much, you’re getting your damn money’s worth. And for what I heard some parents pay for the tickets for their kids, yeah you definitely got your money’s worth for that show. There are still tickets let for tonight’s show and I would 100% push you to go, even if you aren’t a diehard fan, like me, you’ll be blown away by stage production and the performance she puts on.